The Parish Post is the monthly magazine for St. Mildred’s where you can find out what our church groups are doing, plus details of any social events. The magazine also includes articles of general interest. Find out what’s going on in your Parish! 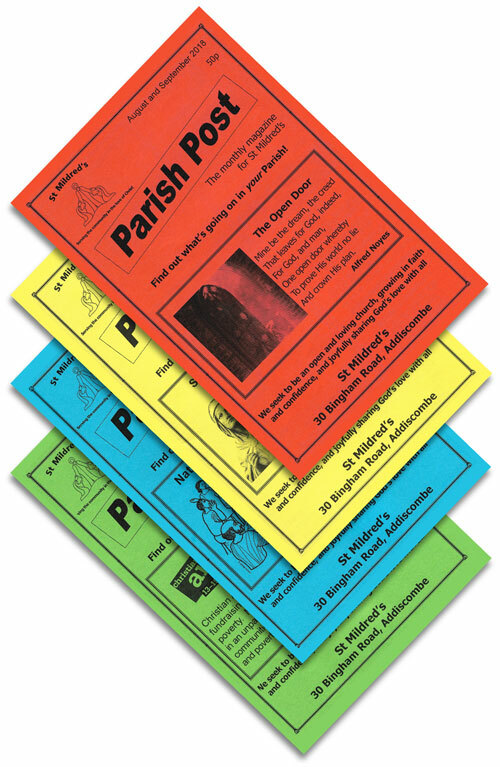 The Parish Post can be obtained from Church for 50p per issue (10 per year) or joining Friends of St. Mildred’s and having it delivered to you. Contact the Parish Office for details on how to purchase a copy or a regular subscription. If you would like to submit an article for publication, please email or write to the Parish Office. Copy deadline is the second Tuesday of the preceding month. Our magazine reaches many households, organisations and businesses – mainly local, but some further afield. To advertise in the magazine, the annual cost (for 10 issues) per advert is £175 full page, £85 half page and £45 quarter page. If you would like to advertise your business or service in the Parish Post, please contact the Parish Office. Tap the links below to view samples of recent issues of the Parish Post. They contain the Vicar’s letter and some sample articles. After contacting the Parish office about placing an advertisement in the Parish Post, you can then pay for the advert online here.